If you are facing problems of power outage, the best way to counter that is to have a portable generator near your hand. There are dozens of good quality portable generators available for sale but each one has different features and suits different situations. Read our Champion 2000 Watt Inverter Generator Reviews to get a good idea if this is the unit you need. However, with this Champion model number 73536i Portable Generator you get the option of using this generator as an inverter. 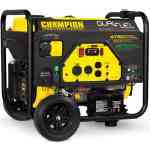 And if you are looking for more power outage then you can check Champion 46539 3500 Watt Generator. It should supply you more power than you need in most circumstances. This portable unit is designed to be a backup for your home and equally sufficient for a work site when you have a power breakdown or the service have not been established yet. This popular portable generator and inverter has some positive attributes and some features that are not included. Hopefully this 73536i Champion 2000 Watt Inverter Generator Reviews will inform you about such things in more detail. Overall Claims Of The Champion Generator? 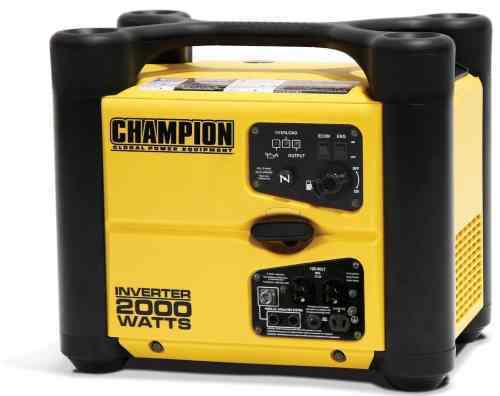 As per the many Champion 2000 Watt Inverter Generator Reviews this is one of the popular products of it’s price pool in the market. The generator is cube-shaped and delivers you 1700 watts of continuous power. When it comes to surge power, it is rated for 2000 watts. The generator provides clean electricity in an efficient way thanks to it’s inverter technology. Champion 2000 Watt Generator runs on a 4-stroke OHV engine. The engine uses gas as fuel to run the whole unit. The incredible thing for the consumers is that they can run the engine on different levels of speed. There is an economy mode during which the engine runs slower and consumes less fuel. You should consider switching to it when the need for power is low. This generator has been designed to be competent when it comes to delivering backup power with little fuel input. It delivers you clean electricity which protects your appliances from overloads or any other hazards. The device has an AC outlet which covers 120V of power. It has a DC output for charging as well. The generator runs for 10 hours when you put 25% load on it. It has “Low Oil Shut-Down” feature to protect the engine when the fuel is low. You can connect another Champion 73536i Generator with this one if you need more power with its “Parallel Connect” feature. You will be able to extract approx 4000 watts of power. The Casing is a unique one for the generator. You will find hard plastic casing working here as the protector from natural wear and tear. Because of the nature of the plastic casing, the generator stays protected from any damage due to movement, dragging, natural disasters and so on. The Noise level of the generator is also on the lower side. It will only make sound measuring up to 53 dB. That is perfectly quiet for people who want to run a generator in their houses. First plus for the device is the design. It is very compact. The warranty period is sufficient with 2 years’ coverage. It has lifetime free customer support if something goes wrong. The support is absolutely free. It comes with CARB Complaint. You can use this in all the states of USA. 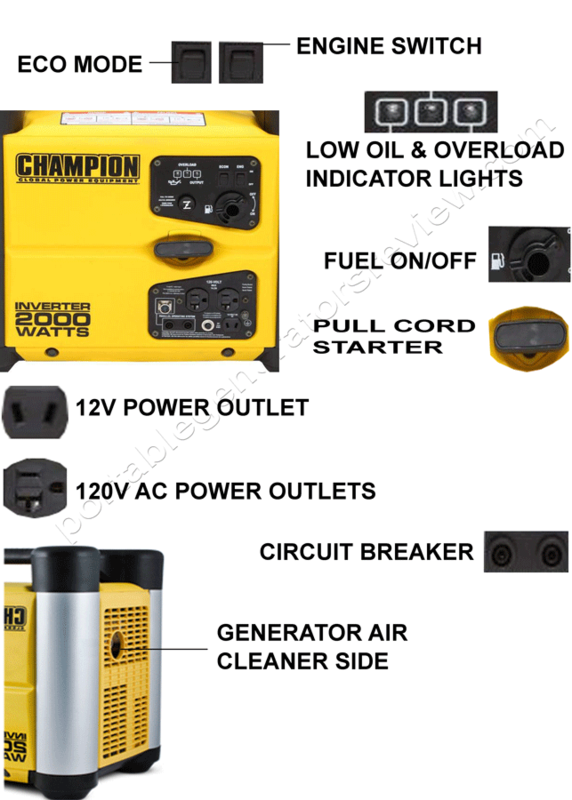 Champion 2000 Watt Portable Generator is safe to use and is efficient. Can be connected with another generator of Champion Power Equipment which is a bonus. This is a portable generator. It will not necessarily power up your entire home. If you buy this with that expectancy, you will feel like you have purchased poorly. To avoid the disappointment, simply calculate the appliances and their needs in terms of power to determine for which ones you require from this portable generator. Other than that the champion 2000w inverter generator problems are few and far between. 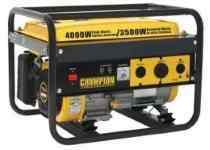 Champion 2000 Watt generator of this model is the perfect one if you are searching for an efficient generator. 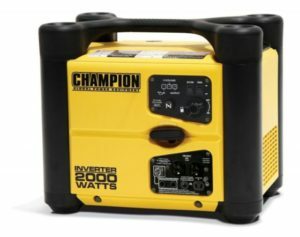 While you may have already read many Champion 2000 Watt Inverter Generator Reviews its may be worth considering a larger unit if you need more appliances. This is perfect for the RV or backup for a small fridge or apartment though. It is great when you consider the power and the safety output. So do not hesitate to outlay money on it, it is perfectly alright to buy if it suits your needs. The champion 2000w inverter generator vs honda is a common comparison as its viewed as a competitor to the best brand names on the market.